Testimony by Roni M (now a former) EVS volunteer in Jászberény (Hungary) where she taught drama classes to local children for 10 months. Autumn, winter and spring in Hungary went by. The cherries on the big trees in our garden were starting to ripen; everything was nearing its fruition and end. 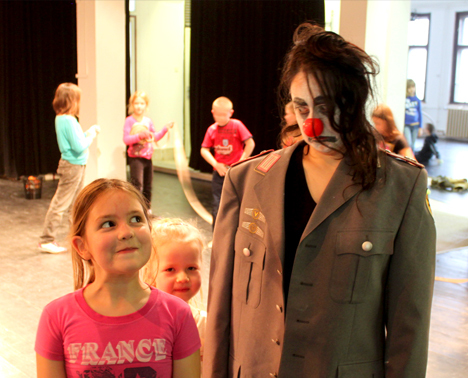 During the months of May and June I had been working hard with the children in our theatre towards their final shows, all of which have been devised originally from scratch. I made final shows with five of my eight groups, a fact which provided for a very busy few months. Each show represented the final product of each group’s own process: I had tried to provide each group with a devising theme that will at once express and complete the process it had gone through throughout the year. 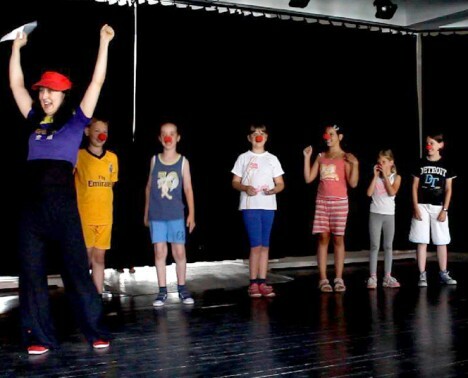 In this way, for example, the group of children aged 7-9, who always seemed to be occupied competing, quarrelling and making up with each other, participated on stage in “The Very Difficult Olympics”, a series of clownish games designed to challenge them to create the possible from impossible demands in creative ways, requiring their co-operation with each other. For example: “Can you… build a house in 10 seconds?” asked the master of ceremonies; “Yes, we can!” they all answered together (to all of her questions), and helped each other into the shape of a house made from their bodies. The group of adults with learning difficulties made a show derived from their favourite game in class, “Watching TV”, and extending it into a sequence they had the good challenge of learning by heart, in which the protagonist enters into her TV and becomes the star of the show while the channels and programmes keep changing around her in surprising ways. And for the final show of my youngest group, comprised of 5-7 year-olds, I chose a theme that I found both them and I to have a good connection with: the seasons (as I had described in the previous post, over the months I spent in Hungary I found that each season had a very different character, and going through the four of them during the course of the year, I was fascinated by this very experience of “growing” with the seasons). Painting an imaginary “summer” with real brushes, music, mime and movement, we poetically depicted the process the children in this group had gone through during the year in their drama classes, a journey during which they discovered many treasures and which culminated towards a sense of “gaining” independence – as expressed in the final scene, in which I stepped out of the picture. The short choreographed sequence was followed by an act of “real independence” in which they acted out a play on the theme of “summer” they have created on their own, for the first time this year, with minimal intervention from my side. Perhaps most challenging for me to create was the final show of my Visual Theatre group of 10-14 year-olds which started in winter and went through a relatively intensive process of experimentation with many different media around the question “how can we combine visual art in performance?” Created using many forms of puppetry and animation, it included a few different scenes the students have created in small groups around the theme we have chosen together of “The Body”. The show was made in a tight time frame due to the fact that the group participants had different commitments towards the end of the year which prevented them from participating in the sessions regularly. A day before the final show, as rehearsals obviously needed to come to an end, I sat and pondered heavily the difficult question of how to combine the different sketches into one piece. Finally, desperate for fresh ideas, I turned that question to the participants of the group. In five minutes they had come up with a story which not only made perfect sense but was wonderfully comic and inventive as well. What I learnt from it, apart from the fact the a devising process is best started much sooner than you think would be needed, is that in any case of doubt about anything creative – ask a child. They will supply the answer without having to think too hard! All the shows were presented to the parents in two (rather hot) evenings. The children and adults were all incredibly excited and performed incredibly well, showing a sense of responsibility and commitment, which made me very proud. Then on poured the thanks, flowers, tears and hugs from participants and parents… Suddenly it struck me that things really did come to an end, and how complete this process was over the 10 months in Jászberény during which I learnt to become a drama teacher, a profession based on one thing: love. I went onwards to a new job doing the very same thing in a new country. It was thanks to my 10-month EVS position that I realised I definitely want to continue pursuing the path of drama in community, and that I got my new job, having gained some very valuable experience in the field. I am grateful for Malom Film-Színház for choosing me for this project and providing an amazing experience like no other; and for Everything is Possible for being there to provide support along the way and, in fact, for making it all possible – namely taking a “Yes, we can” approach after other organisations had turned me down for being in a position with fewer opportunities. I cannot express how much your support and help in realising my right to apply for the programme has helped me. I was able to make a huge professional progress from the situation I was in thanks to you. It really wouldn’t have been possible without you. Thank you. So many great things have been happening in our community theatre throughout the prolonged winter we had and the first slow arrivals of spring, which is now in full bloom (indeed one of the things I enjoy here in Hungary is observing the seasons, which in difference to other countries I have lived in – such as England or Israel – each carry a very different character). I would tell you about a couple of them, which to me have been (only) some of the most significant. European Voluntary Service. At the end of February I have hosted an evening in our theatre for the people of Jászberény. I started it by performing a short mime show created by myself about my refusal to join the Israeli army when I was 17. This experience, explained from both a personal and a comic point of view, provided an intro into the main part of the evening: an informative talk which was meant to shed light on the history of the conflict in the region I have grown up in, of Israel-Palestine. The feedback from the audience was both very appreciative and interested. I was pleased of that, glad to have been contributing knowledge on an important issue in the world, and also felt that the event was building a step up in the acquaintance and connection between me and the local community. A month later I repeated the performance and talk, with some adaptations of course, for a local crowd of teenagers, who have been incredibly interested too. Again I was delighted to feel I have brought something of value and interest to them. The second of the few most significant events in the last term was opening a new class of visual theatre to a group of 10-14 year-olds. This class is a laboratory for experimentation with ideas new to the students and sometimes new to me too. We explore the use of visual art in performance by many different approaches and through the use of very different means: what can we create with broken chair parts? What costumes and sets can we create with old brochures? How can we play with an image projected on a curtain through a projector, and with “eyeballs” made of polystyrene balls being placed on different parts of our body? The main idea is experimentation and play that stem from looking at something in a different way, and it is a delight watching the students create to the stimulations and responding to them from a visceral experience. Watch this space for more detail that I will provide after we had our final show in June. We are currently working towards it, with all groups, while the spring is turning summery and the apples and cherries in our garden are beginning to grow. The cold has gradually tightened its grip on Hungary since I started my EVS (European Voluntary Service) project here in September – up until what seems to be the frosty but beautiful climax that is the current period of ice and snow – but our community theatre has been bustling with creative fire nevertheless in the last few months. First of all, many new groups have been added to our weekly schedule since November, among them a group for adults with learning difficulties and a group in a nursery school. These two have two interesting things in common: the first is that no one person in them or amongst their staff speaks English, which makes me have to try very hard at practicing my Hungarian! (Fortunately I learn it as part of the project). The second thing common to both groups in many cases is the activities – you may be surprised to know that I often use the same games with the adults with special needs and the younger groups of children. I think it’s because they are truly open to anything (if you have worked with people with learning difficulties before you would know this wonderful quality that can be discovered about them). One can say that as result of this they are more in touch with their imagination than other adults going about their adult life with a decent degree of seriousness… and so, similarly to younger children, these people cooperate very well with simple exercises which are about describing what you see from a hot air balloon, for example, or driving a submarine all together through the room. Second of all, we had quite a few very special events at the theatre in the last few months. For the children’s half term holiday from school at the end of October, which happened to be in the week preceding All Saints Day, we organised special holiday workshops – every day a different activity took place at the theatre: creating decorations (and smothering a good amount of paint on chairs – which definitely added some colour to our staff room, as well as to our floor); Circus Day: a full day of workshops on hula hooping, juggling and clowning (which are each of special interest to one of the staff members who organised the day, me being the “clown person”); elaborate mask making from paper mache (which we made straight on our faces. It was rather spooky to see – about 50 mummies in one room); and the culmination of the week – a Halloween Parade around town with the masks we made and the presentation of short performances devised by the children alone for the occasion. Along with all the physical mess (that was only expected to happen), the week was a big success. We received some very appreciative feedback from children and parents which made us very proud. Finally, a few days later, towards mid December, we presented our end-of-term performances to the parents of all the children attending classes at the theatre. Each of the six groups had devised a show with its teacher, summarising the learning process it has gone through during the term. I devised two shows with my two groups; the younger children (ages 4-7) went on an imaginary mimed journey into the bottom of the earth, and the group of 10 year-olds presented a magical winter tale which was a metaphor for finding our inner fire during long days of darkness and cold. With every month passing in my ten month-long EVS project, I feel much older and wiser… I only realise there is more and more to learn as things develop and change. The longer I spend with my groups, the better I can understand them: how to best approach them; how to ignite their creativity; how to work on improving relationships within them. My confidence in planning the activities as well in improvising them on the spot according to changing needs grows. Sometimes I have found it a real challenge searching for new ideas, but I’ve learned that a holiday does well to the creative mind – and I’ve returned from my mid-winter one a lot fresher, and thus more open towards my own creativity. After one year of long wait, the time has finally come to fly to Hungary – and I arrived in Jászberény, a city 80km east of Budapest, with two and a half suitcases and quite a lot of curiosity. I came here to teach drama workshops in English to young people, for the duration of the school year, 10 months. 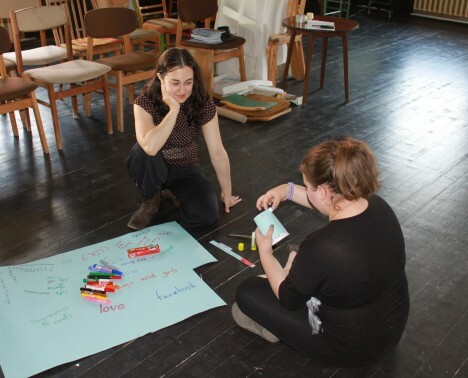 This EVS (European Voluntary Service) position is a wonderful professional opportunity for me, coming at a very appropriate time: after practicing theatre for a few years as a performer and director, it is time to discover how to implement my skills in education, a field I’m very curious about. I recognise that drama, and the arts in general, can be a valuable tool for people, that has the ability to flood the spirit with new energies and provide release, hence transforming emotions, moods and mindsets. Of course that I have experience working with young people, but never before have I been a drama teacher on a full-time basis. This is why I’m very excited about this year ahead (which has already started) and hoping it would be a year of discovery and gaining valuable experience. Our theatre, Malom Film-Színház, is one of very few cultural institutions in this small city and one of very few places offering creative afternoon activities for youth. As the locals put it, “there is not much happening in Jászberény”. Nevertheless it has a generally friendly vibe, some interesting old churches, and lots of grass and trees scattered around. I’m slowly getting to know more and more nice and welcoming local people, which I find helps me make myself feel more at home. Another thing which helps me “arrive” is the Hungarian lessons we take, slowly making signs around me more intelligible and allowing me to better interact with the locals. As every person in the world has warned me, it is known to be one of the most difficult to learn existing languages – and it is indeed different to any other language I had known so far – but I’m determined! We’ve opened the year at the theatre with great excitement – and with essential support from the staff involved, namely from our project coordinator Barnabás and our theatre technician Dáni. Me and my two colleagues (Alba, another EVS (European Voluntary Service) volunteer from Spain, and Ashlee, a paid staff member from England, who used to be an EVS volunteer last year) individually teach 13 groups in total: children (in three different age groups), teenagers and adults. Each age group has very different needs, interests and ways of interaction… how interesting is it to discover each group! The younger children, for example, around the ages of 5 and 6, are full of energy and need a fast pace to keep involved and interested. Our 10 year-old girls group has a passion for acting out imaginary stories… And the teenagers are, as expected, mostly into social status – for them it is all about each other and being in a group. And so the journey with each group in Malom Film-Színház’s workshop space has started, and so far continues with new, interesting discoveries every week about the participants themselves, what stimulates them and how to allow them to access their imagination. To be continued.